My recent trip to H Mart was for more than informational and educational purposes. I was in search of a key ingredient: frozen Chinese mantou buns, which I had been unable to find at any of my local markets. I wanted to make the famous Momofuku pork buns, and the bread was the missing piece. It’s weird to be “famous” for something. Can you imagine being Neil Diamond and having to sing “Cracklin’ Rosie” every time you get onstage for the rest of your life? Neither can I. 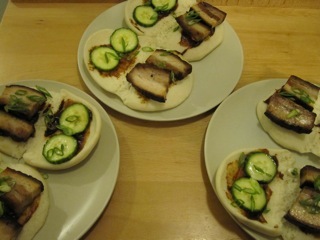 But if Momofuku is “famous” for something, it’s these steamed pork buns. Are they good? They are. Are they something that sprang from our collective imagination like Athena out of Zeus’s forhead? Hell no. They’re just our take on a pretty common Asian food formula: steamed bread + tasty meat = good eating. The recipe is dead simple, but requires a day or two of advance preparation. 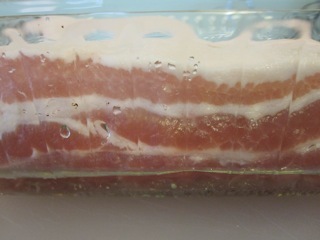 The main component, pork belly, is a separate simple recipe. 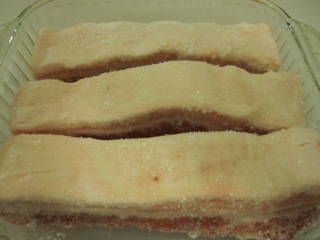 I started with three thick slabs of skinless meaty pork belly and a quarter cup each of sugar and kosher salt. 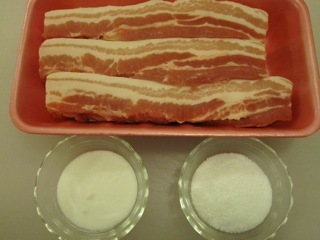 I miked the salt and sugar together, then rubbed it into the pork, which I placed in a small baking dish. I covered the pork with plastic wrap and let it sit in the fridge for sixteen hours. The salt mixture pulled excess liquid out of the pork, which I poured off. I cooked the belly in a 450 °F oven for an hour, basting every thirty minutes, then turned the heat down to 250 °F, baking for another hour. 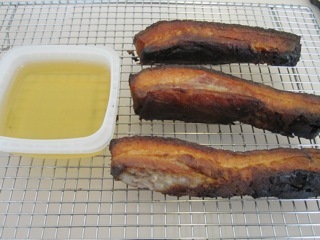 I cooled the pork on a rack and strained the fat for future use. If you look carefully, you’ll see that the closest slab has a lighter corner: chef quality control, of course. I wrapped the pork in plastic for another rest in the fridge. The most difficult part of the recipe was complete. Final assembly of the dish took less than thirty minutes. 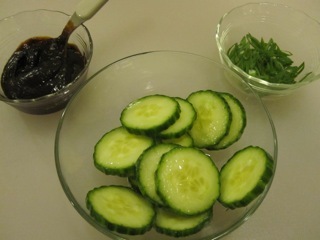 I prepared the garnishes first: a sliced scallion, a few tablespoonfuls of hoisin sauce, and quick pickles made by tossing sliced English cucumber in a tablespoon of sugar and a teaspoon of salt. 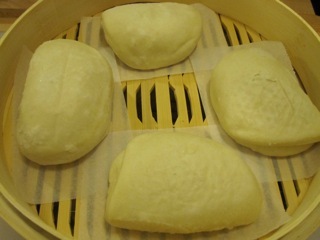 I placed the frozen buns on squares of parchment, then set them into a bamboo steamer. If you have that option – a Chinese bakery or restaurant where you can easily buy them, or even a well-stocked freezer section at a local Chinese grocery store – I encourage you to exercise it without any pangs of guilt. How many sandwich shops bake their own bread? Right. Don’t kill yourself. But don’t be put off by the idea of making them either. They’re easy and they freeze perfectly. 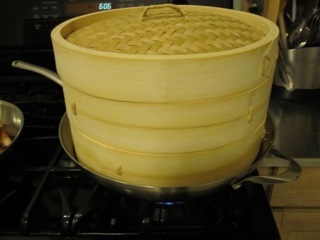 I set the steamer on a wok of boiling water and let the buns reheat for about three minutes. While the buns steamed, I sliced the pok inth half-inch by two inch slabs, and heated them over medium heat until they were soft. For the final assembly, I opened the buns, smeared them with hoisin, placed two pickles on one side and the pork on the other, then garnished everything with a small sprinkle of scallions. A quick fold and they were ready to eat, with a bottle of sriracha sauce on the side for optional heat. When a dish has as few ingredients as this one (seven: buns, pork, cucumber, scallions, hoisin, salt, and sugar), each has to support the others, the balance has to be perfect. 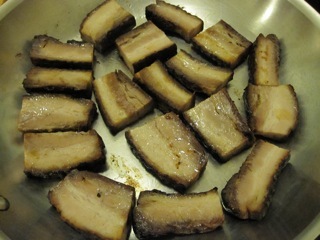 Even though I didn’t make a traditional char siu pork preparation, what I tasted was the flavor of char siu. It may not have had the complexity provided by a five-spice rub, but I didn’t miss it at all. This is the genius of Chang’s recipes: he recreates the tastes of traditional dishes perfectly, but with much less work. The three of us practically inhaled the buns, they were that good. 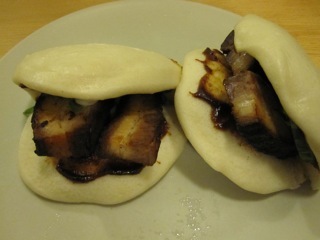 A return trip to H Mart is in order very soon; I need to buy more pork and buns for the freezer. I made these myself a few weeks ago, and can attest they are as good as they look. I’d encourage you to try making the buns yourself (I’m a baker, that’s how I, um, roll). They freeze beautifully, and take less time to make than finding yourself a parking space at H-mart. I made mine with jowls instead of belly, since I have a freezer full of them, and they were great. I plan on making the buns soon. Where did you find the jowls? I’ve had trouble locating more. I get them from my meat CSA (Houde Farm). I’m loathe to reveal quite how cheap they are, since then they won’t be any more. I should try advance ordering them from my meat CSA, Stillman’s.